I couldn't help but be intrigued, especially as it retails for a very purse friendly £5.99 - compare that to the £30 bottle of Estée Lauder that usually graces my bake and I couldn't stop myself from throwing it in my basket. A frosted glass bottle with A PUMP!! Ok, so maybe the pump also had a factor in me buying this foundation too. The packaging id pretty sweet for a drugstore brand. The frosted glass is not unlike the previously mentioned Estée Lauder Double Wear and even though I've been carrying this bottle around for over a month in my make-up bag, the bottle detail has worn extremely well. 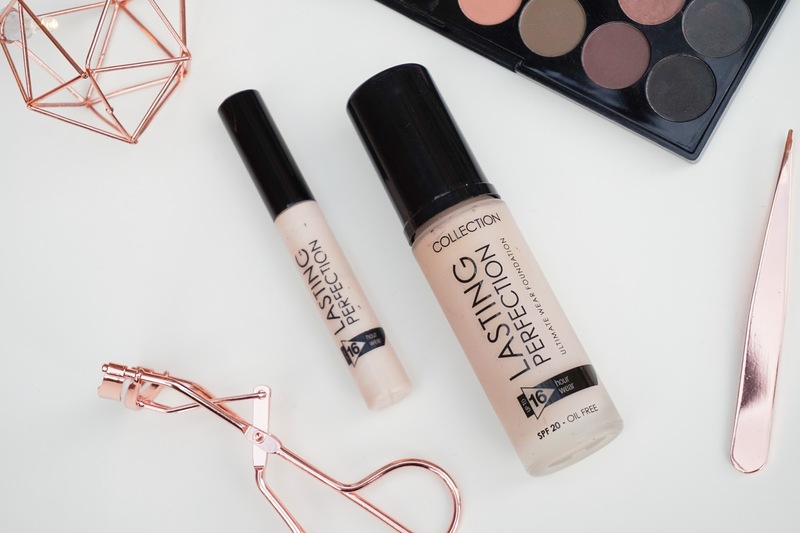 I'd say the Collection Lasting Perfection Foundation is a medium to full coverage and that's what I would usually reach for when I'm heading for a night out or during the autumn/ winter months. On first pump you can really see the thickness of the product and to be honest it did put me off initially as I thought it might be too full on for my skin. But, and this is a big BUT - this foundation claims to have a 6-in-1 effect. It's designed to prime, conceal, cover, smooth, protect and mattify - meaning you really shouldn't need those other products. One pump of this foundation gives me a medium coverage and an additional half pump turns it into a full coverage. The formula sets quite quickly so it's one you need to get to work right away with but I'm used to that as a Double Wear addict. The scent is every so slightly fruity but un-offending and doesn't seem to linger which for fussy old me is perfect. For £5.99 the Collection Lasting Perfection Foundation has become my go-to on those days where I want great coverage but don't want to use my expensive products. I suffer from large pores (TMI? soz) and blemishes and I completely agree with the 6-in-1 claims. I don't use a primer or concealer on days when I wear this foundation. The formula does smooth and conceal things I want to hide but it's certainly not as mattifying as my beloved Double Wear. I always seal my foundation with a loose powder as I get pretty oily throughout the day so that fact this product is oil free is ideal but I do still find myself having to lightly buff, blot and powder again halfway through the day but I see that as the norm really. I'd certainly rebuy this foundation again, sadly it won't be great for everyone as the shade range is very limited with only six shades but for myself the lightest shade; Porcelain 01 was perfect. Are you a fan of the Collection Lasting Perfection Concealer? Then go forth and give this bargain beauty a bash! !